I started my class blog following the SLAV Personal Learning Network PD I was a part of early in 2010, where I had learnt so much about Web 2.0 tools and the many benefits of blogging for Learning and Teaching. I was excited about the potential for local and global collaboration and creating strong links between home and school. I had always used ‘myclasses’ as a way to communicate with parents about what was happening in the classroom however I could see the enormous potential of creating a class blog. As a Prep teacher I spend a lot of time modelling how to use a blog. Through this modelling the students are learning important protocols and safe behaviours when navigating the online world. I am responsible for posting photos, writing most of the posts and moderating comments. My students take part by sharing reflections on their learning using tools such as voicethread, wallwisher and videos. I share their writing, reading, maths and art through slideshows. My students also become involved in commenting. I model the process and at this early stage of the year I type their thoughts and ideas. My students are articulating to a global community what they have discovered helping them to consolidate and deepen their understandings. Many visitors to our blog ask interesting questions that extends the students thinking and challenges them to consider new perspectives. These are some of the powerful advantages of blogging. While we have had success reaching out to the global community one of the challenges of blogging is involving our parent community. My major aim for developing a class blog was to connect with parents and families. To provide a springboard for conversation at home about what is happening at school and how the students are thinking and learning. While some parents do visit and comment I have had limited success with this. As a school we are hoping to provide a parent night on blogging to address this issue. 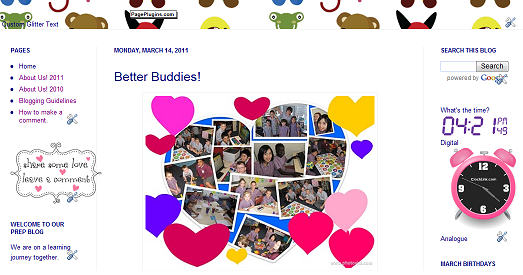 Blogging allows for authentic and rich conversation both within and beyond our school community. Thankyou, Marie, for sharing your fantastic work, and the work of your students. 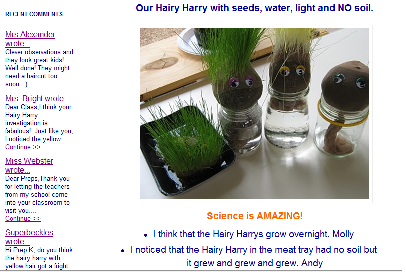 I particularly like how visually appealing Learning Together is, with the images of your students and their work. Your adopted pet Freddie, the spider, is a cute extra on the blog and a good way to create interest in any blog (e.g. name the virtual pet or avatar). Learning Together provides uses of web 2.0 tools that will offer inspiration to many.